Children’s Miracle Network Hospitals has experienced great success at recent Radiothon events. Two markets saw excellent increases in funds raised compared to last year; Watertown (KSDR) by 15% and Providence (WPRO) by 5%. 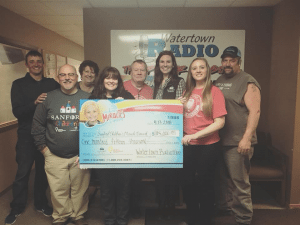 Despite a record-breaking blizzard, putting Watertown under more than a foot of snow and forcing them to end their radiothon event three hours earlier than scheduled, listeners and sponsors rallied to raise over $115,000! All funds stay in South Dakota at their local Children’s Miracle Network Hospital to pay for equipment, training and programs that will benefit the thousands of children treated at Sanford Children’s Hospital each year. The 14th annual Hasbro Children’s Hospital Radiothon raised $422,431.33 for Hasbro Children’s Hospital. 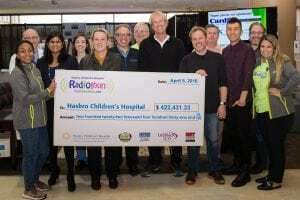 The Hasbro Children’s Hospital Radtiothon, airing on WPRO-AM, WPRO-FM, WWLI-FM, and WWKX-FM was a great success! Our Cumulus partners brought in voice tracked talent Ralphie from NY, Miss E Class from Indianapolis, and syndicated host John Tesh from L.A. to host this amazing event. John Tesh even shared the cause on his social media channels and generated donations from around the country! Thanks to the efforts from the station, and the community, these funds will purchase life-saving medical equipment, provide vital health services and support programs for kids and infants at their local Children’s Miracle Network Hospital.